One of the central units of the United States of America; admitted into the Union in 1854. Jews traversed the state on their way to California during the gold-finding period of 1848-1849; there is, however, no record of their settling in Nebraska until 1856, when Meyer Hellman and Aaron Cahn, floating a house down the river, settled where the city of Omaha now stands. Not until the close of the Civil war did the Jewish settlement become noticeable, and with the advent of Max Meyer in 1866 a progressive spirit became apparent. The "seventies" and "eighties" brought a large Hungarian and German element, which was subsequently supplemented by Russian and Rumanian accretions. The present (1904) Jewish population of the state is about 3,800. The Jewish population of Omaha is about 3,200. The Temple Israel congregation there was organized in 1868. It held its first services in the old Masonic Hall. The following rabbis have served the congregation: L. Abraham, David Stern, Rosenspitz, E. H. Harfield, N. I. Benson, William Rosenau, Leo M. Franklin, and Abram Simon. The congregation maintains a Ladies' Aid and Sewing Society (organized in 1896) and the Temple Israel Sisterhood (1903). Its burial-ground, the Pleasant Hill Cemetery, was purchased in 1872. 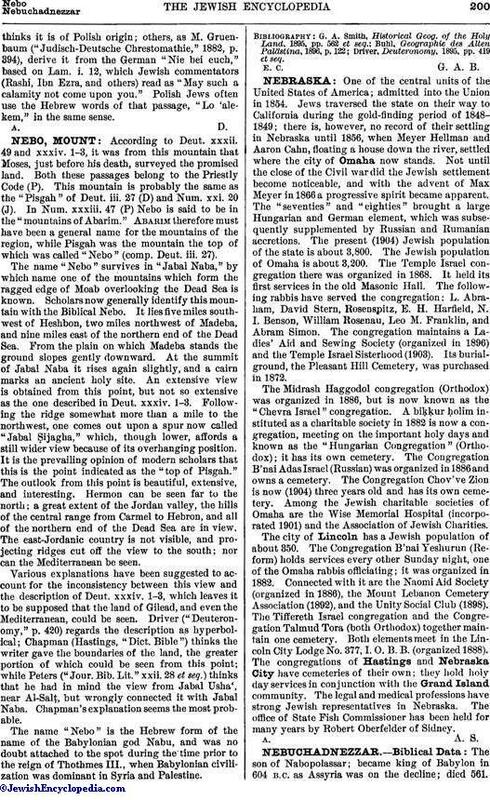 The Midrash Haggodol congregation (Orthodox) was organized in 1886, but is now known as the "Chevra Israel" congregation. A biḳḳur ḥolim instituted as a charitable society in 1882 is now a congregation, meeting on the important holy days and known as the "Hungarian Congregation" (Orthodox); it has its own cemetery. The Congregation B'nai Adas Israel (Russian) was organized in 1886 and owns a cemetery. The Congregation Chov've Zion is now (1904) three years old and has its own cemetery. Among the Jewish charitable societies of Omaha are the Wise Memorial Hospital (incorporated 1901) and the Association of Jewish Charities. The city of Lincoln has a Jewish population of about 350. The Congregation B'nai Yeshurun (Reform) holds services every other Sunday night, one of the Omaha rabbis officiating; it was organized in 1882. Connected with it are the Naomi Aid Society (organized in 1886), the Mount Lebanon Cemetery Association (1892), and the Unity Social Club (1898). The Tiffereth Israel congregation and the Congregation Talmud Tora (both Orthodox) together maintain one cemetery. Both elements meet in the Lincoln City Lodge No. 377, I. O. B. B. (organized 1888). The congregations of Hastings and Nebraska City have cemeteries of their own; they hold holy day services in conjunction with the Grand Island community. The legal and medical professions have strong Jewish representatives in Nebraska. The office of State Fish Commissioner has been held for many years by Robert Oberfelder of Sidney.